Set your table with Elegance!! Enjoy our new line of premium designed plastic octagon plates with a lace border. 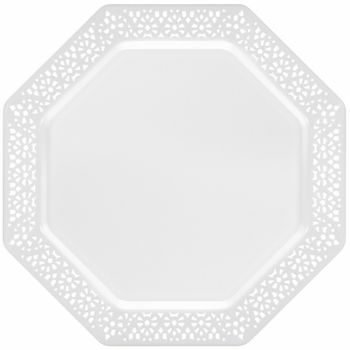 This unique white plate with white lace border is great to use at any formal function. Available in 11", 9", 7" and bowls as well. Lacetagon 11" White w/ White Lace Border Octagon Banquet Plastic Plates 10ct. Lacetagon 9.25" White w/ White Lace Border Octagon Luncheon Plastic Plates 10ct. Lacetagon 7.25" White w/ White Lace Border Octagon Salad/Dessert Plastic Plates 10ct. Lacetagon 14oz. White w/ White Lace Border Octagon Soup Bowls 10ct. Lacetagon 5oz. White w/ White Lace Border Octagon Dessert Bowls 10ct.